Serra do bone @ home a photo by Lameen on Flickr. 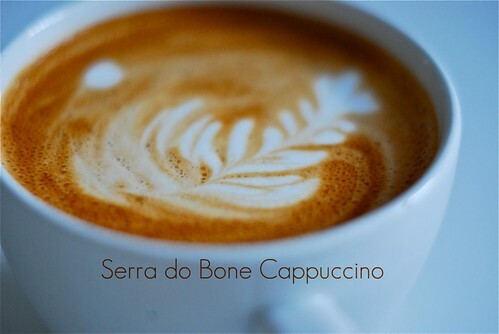 Serra do bone @ home… why ? It’s our number one coffee at Escape Caffe, but always wanting to test parametres, I decided to take some spare beans home to use on my Isomac espresso machine and lets say, not as expensive conical grinder at home. After all, it was at home that I honed my barista skills, studying the bean and writing about different coffees and roaster profiles. At Escape Caffe, we have a La Marzocco 3 group Linea with a built in PID set at 93.6C and we use the becoming popular Anfim Super Camiano grinders – machines way superior to what I have at home, BUT nevertheless I’m thrown back to what Mark Prince (Coffeegeek extraordinaire for those who don’t know) said about preparing espresso “if you follow the rules, you can make a really good espresso at home using a great home grinder and semi-pro espresso machine” (not exact quote but along those lines). In any case, if you follow the rules, you can make better espresso based drinks at home than the vast majority of cafes in the World. I’m not going to get dragged down into the detail of the rules, but in summary they are (i) fairly freshly roasted arabica coffee beans, i.e. within 10-20 days (ii) a decent burr grinder, costing at least US$250 (iii) a semi-pro espresso machine with E61 group head, with lots of brass and heavy metal – this will cost around US$600 (iv) ability to tamp at around 30 pounds of pressure and (v) a very good idea of how to be a home barista, so that you know for example what grind to use so that you get about 25ml of espresso in 25 seconds when you extract coffee, etc, etc. OK ! so how was Serra do Bone at home ? Pretty nice but with different taste profiles. First up, a bit about the bean – it’s an organic arabica coffee bean, winner of the Cup of Excellence in Brazil, used by Intelligentsia as their organic espresso, displaying taste profiles such as candied apple, cocoa, raspberry, cherry with a medium body and soft acidity. Secondly, don’t be misled by all the taste notes as you are unlikely to taste everything in one cup, because different brewing techniques, as well as temperature and moisture affect the eventual taste of the coffee, but that’s another blog. So in summary, was I disappointed ? NO ! because I stuck to the hard and fast rules. So, at the caffe, we kind of pick up the cherry cocoa elements and when mixed with milk, you get a chocolate berry taste with a hint of caramel, but at home I got a sweeter cocoa caramel taste, which is still very yummy. One reason for the slight difference could be environment, a hihger brewing temperature as my Isomac doesn’t have a PID, as well as the obvious, my Isomac is no La Marzocco, BUT if we follow the “rules” the main taste parameters remain the same. I would love to run a home barista course one of these days, so that people don’t get scared by the prospect of investing in a decent espresso machine and good grinder. So Serra do Bone at home last week got me to practice my latte art skills, as well as sample a very tasty coffee, and get a good pic of my cappuccino, YUM ! Before I go, apologises for the long delay in blogging – I promise to be more frequent in 2011 – also this is officially my 100th post, yipee ! This entry was posted on Saturday, March 19th, 2011 at 12:13 pm	and tagged with arabica, Brazil, Cape Town, Cappuccino, coffee, Cup of Excellence 2010, La Marzocco and posted in Bean Talk - Coffees, Coffee Recipes, I'm Drinking, Uncategorized. You can follow any responses to this entry through the RSS 2.0 feed.